A Winter Olympian turned corporate executive has addressed senior HR leaders at a major conference, discussing the importance of making a plan and remaining resilient. Alisa Camplin defied expectations to take first place in freestyle aerial skiing at the 2002 Winter Olympics – making her the first Australian woman to win a gold medal in the history of the competition. However, as if that achievement wasn’t impressive enough, Camplin’s personal circumstances made the win all the more incredible. After taking the sport up at the relatively old age of 19, Camplin had just eight years to reach elite level, battled countless injuries – including two broken ankles just six weeks before the final competition – and was forced to juggle several part time jobs to fund the campaign. “You don’t want to know the kind of people who are ordering pizza at 1AM on a Tuesday,” she quipped, after revealing that she had not only delivered pizza but also cleaned houses and coached gymnastics. Despite all of this, Camplin was also working full time at IBM – pursuing a high-flying career which she refused to neglect for the sake of her sport. Now, she sits on multiple boards and is a renowned high-performance consultant. Speaking at the 2018 National HR Summit last week, Camplin revealed exactly what has made her incredible success possible. 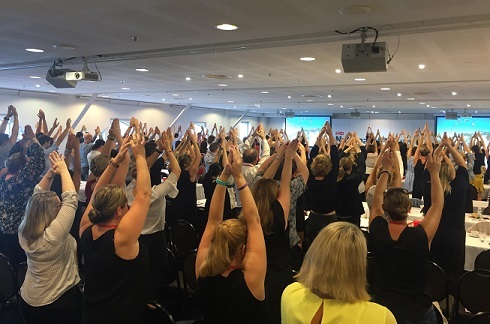 “Have a plan, surround yourself with the right people and then break it down into process steps,” she told a packed room at Sydney’s Luna Park. For every major goal in Camplin’s life – both professionally and personally – she adopts a pyramid planning system with specific goals or competencies and a timeline for improving. “It sounds very dry and when I tell people about it, I can see their eyes glazing over, but this plan is what got me to the Olympics, it’s what I use in my career and I even use it at home,” she said. A key part of the plan, she added, is preparation. Detailing numerous examples, Camplin offered insight into the minute planning that went into winning the Olympics. “We tested absolutely everything and practiced for it – we tested water bottles, different snacks, we practiced what to do in a whether delay, we practiced what to do in an injury delay – I knew exactly what I would do if there was a three-hour pause because that sort of stuff happened in my sport all of the time,” she said. Building the right team, she said, was also equally important and Camplin shared insight into the vast improvements she saw after she expanded her training network to include coaches and experts with a holistic approach to training. “To achieve great things, you need to work with great people but sometimes you actually have to go out and find those people,” she urged. Camplin also encouraged business leaders not to lose sight of the small wins or the important processes which all work towards a greater goal. “We all know we should celebrate success but we all feel like we have to wait for the big things – like winning the Olympics – before we pat each other on the back but that’s ridiculous because sometimes it the small things that make the biggest difference,” she said. Of course, Camplin acknowledged that sometimes – no matter how much planning a person does or how accomplished their team is – something absolutely unexpected can occur. “Sometimes in life you can plan the pants out of things and life will still throw you the crappiest of curveballs so all you can do is build yourself to be resilient enough to get through that,” she said, recalling the death of her first son at just 10 days old of a Congenital Heart Disease. The physical, mental and emotional resilience she’d built throughout her sporting and professional career enabled Camplin and her husband to channel their grief into something positive. The pair founded Finnan’s Gift, in the name of their late son Finnan Maximus Camplin-Warner, supporting the Royal Children’s Hospital in Melbourne. Since then, the charity has helped raise over $2 million.